Getting the right balance of nutrients for your fish is naturally very important and fish can vary quite a bit in their requirements. Often the easiest option is to use a commercially prepared flake food - but which should you choose, and what should you know about it? Flake foods have been a popular choice for many years now. They're easy to store and don't require preparation, and most of them are suitable for a wide range of fish species. Designed as they are to float on the surface, they work best for surface feeders, so in a community tank you may need to be careful to make sure that mid-water feeders and bottom-feeders are getting enough. Fish who are smaller or weaker than their tank-mates may also find it difficult to compete for flake food. Fish with smaller mouths may need you to crumble flakes so that they have a chance to compete. The most common problem with flake food is overfeeding. Fish should be fed once or twice a day and should never need more than a minute to clear the surface of the tank. Uneaten food contributes to pollution and damages water quality, whilst overeating can make fish ill. Bloating after feeding can also be caused by allergies. Most flake foods are bulked out with cereals such as wheat (which help to provide necessary roughage) and a significant number of fish are allergic to gluten. If you suspect this is a problem, try alternative foods and see how the affected fish respond. An alternative formula flake food may provide a long term answer. There are several factors to consider when choosing the right flake food for your aquarium. Some species of fish thrive on an almost exclusively carnivorous diet and, if they'll accept flake food at all, need a special meaty formula. Others need a diet which is high in vegetable matter and do best on vegetarian formula flakes high in cereals or spirulina algae. In a community tank it's usually best to use a general, omnivore friendly flake food in order to make sure all your fishes' needs are met. 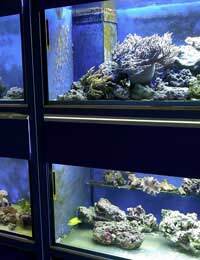 What fish require in their diets also varies according to the environment in which they live, so you'll need different flake foods for your cold water, tropical and marine aquariums. Most flake foods are fortified with extra vitamins and minerals to provide those nutrients likely to be missing in the aquarium environment. For this reason it can be a good idea to feed the occasional flake meal even if your fish usually eat a different kind of food. Some flake foods use different colourings to distinguish different formula flakes within the same preparation, enabling you to select what your fish need on particular occasions. This means, for instance, that you can feed high protein flakes to a fish recuperating from illness or flakes high in carotenes (which enhance colour) to a fish about to go on show. Flakes are comparatively easy to feed by hand, so if you're patient you can supply extra food to individual fish once they have learned to trust you. This is useful if you have fish who are reluctant to eat, in which case you may find that you can successfully tempt them with a special formula flake food such as brine shrimp flake. There's little evidence that these specialist flakes provide better nutrition, but they often have a stronger smell, making them more appealing to difficult fish. When choosing a flake food you should keep in mind that what your fish need most of all is a balanced diet. Feed specialist growth, colour or breeding preparation formulas only at the appropriate times and always go back to a regular formula afterwards. Flake food is a practical choice because it enables you to provide balanced nutrition with very little effort. Many fish love it, and it's a useful stand-by for almost every aquarium.